Hello there my lady friends, are you up for a run? 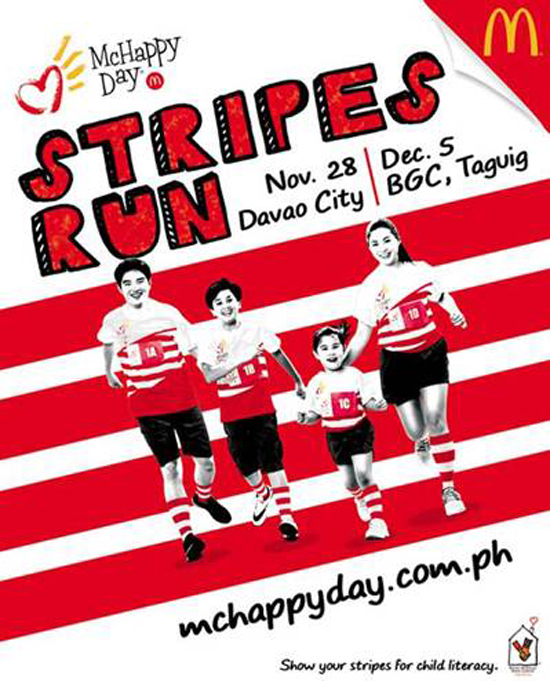 McDonald’s Philippines' McHappy Day Stripes Run 2015 will happen in Davao City on November 28th, that’s Saturday in People’s Park, Camus Corner Palma Gil Streets. Fun category choices ranges from 1km to 10km distance run. The winners will receive cash and gift certificates. Running takes a whole new level of fun as McDonald’s brings families and individuals together to run for a great cause--helping more Filipino kids learn how to read! The annual #McDoStripesRun raises funds for the “Ronald McDonald Read To Learn” program, which to date has helped 11.5 million Grade 1 & 2 public school students. That’s a whole lot of noble reason why you’re going to bring the whole family and join the run. So let’s get physical, bring your family and have fun and help some kids learn how to read. See you!